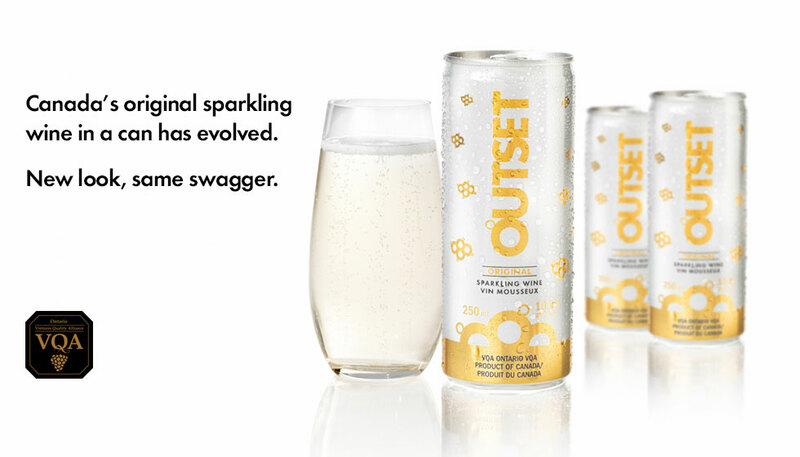 Canada’s original luxury sparkling wine in a can. Originally born out of the desire to stand out amongst a very saturated Niagara Wine Market, Outset has established itself as a product rooted in innovation, universally coveted across a variety of refined palettes. Leveraging the individual strengths from each member of the Genesis Wine Group collective, the brand launch achieved resounding success. Within its first year, it was approved for distribution by approximately 300 LCBO, Manitoba Liquor and Lotteries, and SAQ locations. It also earned various industry accolades for taste, innovation, and packaging design including a Gold Medal in the Finger Lake International Wine competition. In addition to its national launch, Outset also had a successful entre in to the Chinese market partnering with B2B clients such as hotels and restaurant chains. In fact, it was so popular that it sold out within six weeks, and they are already prepping for the next export to the Beijing/Guangdong province. Despite challenges to establish credibility amongst the traditions(view) tastes of oenophiles and critics alike,Outset has managed to win over the minds of its’ audience. Backed by superior product quality, a bespoke marketing and product strategy, and the relentless creativity and courage of the Genesis Wine Group, Outset has solidified its position as a market leader. Outset is an aromatic sparkling wine crafted with a kiss of Vidal Icewine. Pale gold with aromas of bright stone fruit and citrus, a crisp acidity runs across the palate to give a lingering and refreshing finish. A fine balance of sweetness and perlage, the mouth feel is savoury, soft, and smooth. Tickling the palate with a sweet effervescence of peach, apricot, and honey. Uniquely versatile,Outset is as perfectly paired with citrus-cured salmon gravlax or foie gras, as it is with popcorn, potato chips, or any other accoutrement that pairs with binge watching on the couch. Appetizers: duck prosciutto, scallops with potato pancakes and caviar sauce, citrus-cured salmon gravlax, or fois gras with peanut cream and maple jam. Outset is the perfect companion, for any event. Perfect for small gatherings, momentous occasions, intimate conversations, and even one-night stands. There is no wrong way to enjoy Outset, but there is a rite of passage. Although Outset is perfect on its own, naked as the day it was crafted, it’s also completely acceptable to enjoy it with frozen fruit, in a cocktail, or through a straw. For a perfect experience, we recommend just two things: a glass and a five-way collaboration with each of your senses. What’s your origin story? Snap a photo of yourself enjoying Outset using #OUTSETStory for your chance to win a behind-the-scenes day pass to Between The Lines Winery in Niagara-on-the-Lake, Ontario. Spend a day exploring the minds the Genesis Wine Group, and experience first-hand the new balance between heritage and modern winecraft.